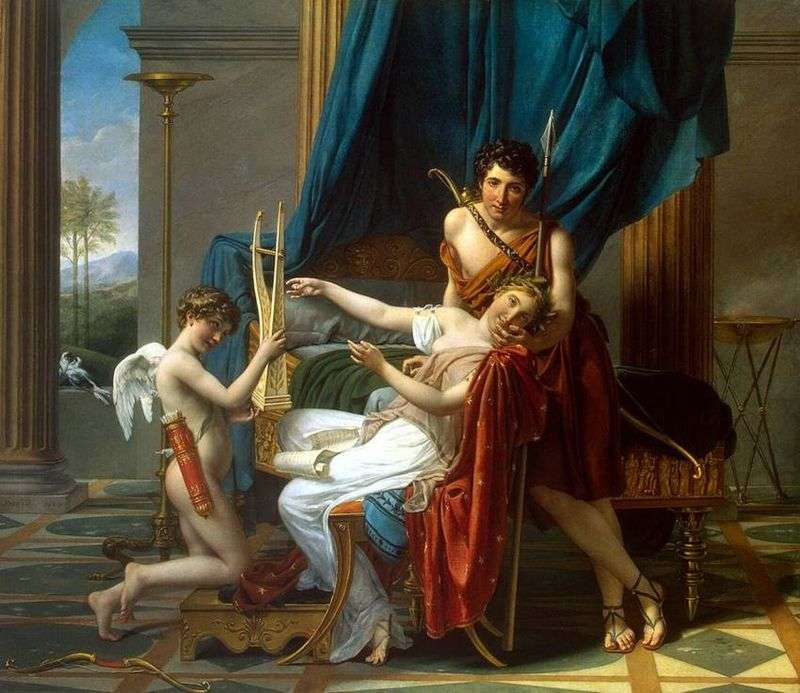 Painting of the French painter Jacques Louis David “Sappho and Faon”. The size of the picture is 225 x 262 cm, canvas, oil. Jacques Louis David – the founder and head of neoclassicism, the artistic trend, based on the ancient heritage and prevailed in the late XVIII – early XIX centuries. The painting “Sappho and Faon” is typical for the mature work of David. It depicts Sappho and her beloved Faon. Cupid, stretching Sappho lyre, symbolizes love as a source of creative inspiration. Safo – the famous ancient Greek poetess, a representative of melikal, musical-song lyrics, contemporary of Alkey, a native of the lesbian city of Eres; lived at the end of the VII and the first half of the VI century. In the ode of Sappho, the name of Faon, a boatman from Mytilene, whom Venus endowed with unfading youth and captivating beauty, is not found. The legend about the unrequited love of the poetess Sappho to the beautiful young man Fahon, because of which she threw herself into the sea from the Lefkada rock, arose much later. For the first time this story appeared in the composition of Menander “Leucadia”. David took this legend as a basis, which is felt even in details. As the main plot, the artist chose an episode when the poet composes an ode in honor of his lover. Appearing at this moment, Faon gently touches her face. Sappho leaves the game on the lyre, supported by Cupid. Her poetic inspiration gives way to love ecstasy. Among the scandalous episodes of Sappho’s life is her love for the young man Fahon, who refused poetess in reciprocity, so she threw herself into the sea from the Lefkada rock. The expression of rushing from the Lefkada rock became in everyday language equivalent to the expression of committing suicide and also meant the threat of putting your hands under the influence of despair. Apparently, David knew not only the individual lines of Sappho, but also the so-called letter of Sappho, addressed to the Faun and composed by Ovid. On the scroll lying on the knees of Sappho, the verses in the ancient Greek language read: “Happy is he who is knit in the blessedness of the gods, Who sits close to you and sighs for you.” These are the first lines of the first ode of Sappho. Above the text of the ode, explaining the plot, the artist put the name of Faon. Historical and archaeological authenticity in the depiction of antique clothing, shoes and details of the situation is combined with David’s idyllic interpretation of love harmony: a languid neose posture, as well as such traditional metaphors of love as a pair of kissing doves and two trees in the landscape. Description and meaning of the painting Sappho and Faon by Jacques Louis David.